Aalayam - Colors, Cuisines and Cultures Inspired! : Diwali Tablescape and Diwali decor inspiration, the Aalayam way! Diwali Tablescape and Diwali decor inspiration, the Aalayam way! Add glitz and glamor to your Diwali tablescape - I've done it with crystal, color and metallic accents! As with every other festival, I am still finding my way around traditions and Diwali is no exception. I yearn to recreate the traditions of my maternal home and long for the Deepavali of my childhood. Lucid memories of facile traditions are rekindled - the oil bath at the break of dawn that heralds the onset of the three day festivities, the aroma of the delicacies prepared by mom, the stash of firecrackers painstakingly divided in 2 equal halves by us (bickering) siblings, earthen diyas awaiting to be lined in neat little rows, visiting aunts, uncles, grand parents in all our Deepavali finery, boxes of sweets and the glittery explosion of firecrackers! The magic of Deepavali beckons – after all it is the most adored childhood memory for most of us. Nothing says Diwali like a traditional thali dinner! Fast-forward to my expatriate life and Diwali is a weekend potluck dinner, rows of tea lights and maybe some sparklers! A far cry from Diwali’s of the past! Italian etched goblets work great for serving mango lassi! Pair them with colored water tumblers! But over the years, I have learnt to add the sparkle back in small doses via our own family traditions while ardently reflecting on past Diwali’s . At the heart of our celebrations is a good Diwali meal and that is what today’s post is all about. I am passionate about my Diwali meals and many of my own festive memories are intrinsically tied to the food traditions – my grand mom’s rice appams (yele appa) were to die for and I long for it each Diwali. Talk about Pavlov’s classical conditioning! Living in America, I have come to appreciate Western holiday traditions that are strongly rooted in food and feasting and so I attempt to savor Diwali via a meal that promises to bring food, people, culture and tradition together. And hopefully, these meals will leave lasting impressions on my young one and conjure up fond memories of a radiant Diwali night. This year, I pulled out all the stops in creating a magical tablescape for our dinner guests. I will break this down for you step by step – stay along with the pictures and please do not hesitate to ask me any questions. Make sure to stay with me till the end of the post as I have a giveaway to announce! We also have more Diwali decoration inspirations in our previous year's post. Make sure to check out this, this and this! Creating a beautiful Deepavali tablescape - made easy! Add the layers one piece at a time - silver chargers are versatile decor pieces! I love creating visually decadent tablescapes and I promise you there will be many more tablescapes on Aalayam. This year, I have combined my eastern heritage with my travel inspirations to create a tablescape that merits a distinction of its own. It all started with the crystal candle holders that I found at Home Goods this year – they reminded me of the crystal chandeliers that I saw in the Hall of mirrors at the Palace of Versailles (remember our trip to France?). That was my inspiration! 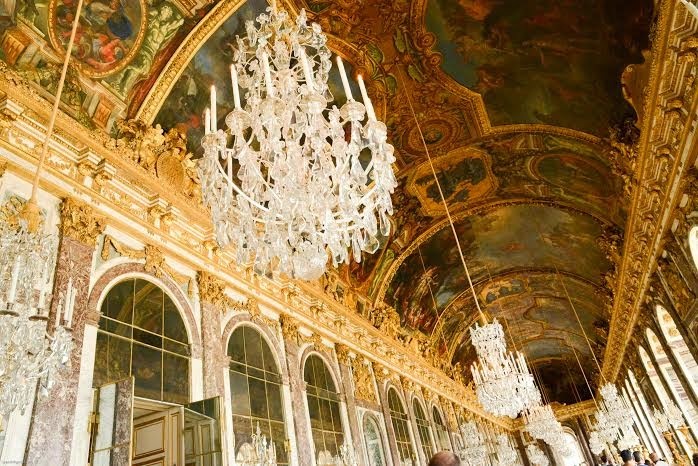 Hall of mirrors- The Palace of Versaille! I was blown away by the delicate beauty of the French chandeliers and swore to add a touch of French chic to our home. I was euphoric when I found these candleholders– they were definitely going in my Deepavali décor this year. A travel inspiration works its way into a tablescape at home- for the love of crystal light accents! And then it quickly became a matter of adding things that would work with these focal pieces. Colors, textures and patterns were blended in experimentally till I knew I had nailed it! Paisley - the ultimate ethnic motif! Create cohesion – by threading different elements with a common theme. In this case I used the Paisley motif to unite the various components and keep the eye moving. The block print paisley napkins, the hand made cards with the paisley stickers and the amber glasses with the paisley motif all work great together and add an ethnic charm to my tablescape. Always buy enduring pieces and get more mileage out of them - gold toned flatware paired with silver charger and a steel thali - it works! Use versatile pieces – the fabrics, the tray, the thalis (plates) and the goblets are enduring pieces that I can creatively combine to create an entirely different look next time. So, take stock of what you own and think about how you can use it before you go shopping. My solid blue cotton tablecloth will work well for a birthday or a tea party next time. By layering a saffron block print napkin on it, I have added a festive tenor to the base layer. A fun conversation starter - the great Indian two-wheeler, move over elephants and peacocks! Think outside the box. After all you are trying to create a memorable scene that can be remembered long after Diwali is gone. My steel scooter is a fun conversation starter and a fond reminder of home. Let the elephants and the peacocks be… after all there is more to India! Indulge a bit - After all you will be adding a touch of sparkle to your wardrobe. So, why not add some glitter and shine to your home and your dinner table too? I love the sparkle emanating from the light reflected off the crystals in my candleholder. I love the colorful radiance of the rhinestones used in handmade Deepavali signage and my personalized greeting cards. I love the sheen on my gold toned flatware. There’s lots of ways to add sparkle and shine to your décor and here’s just a few ideas. Make sure to let the flowers pop - they need not all match! Stay away from faux flowers – please! My friendly neighborhood florist patiently replaced all the fall colored flowers with bright fuchsia ones to create this vibrant bouquet. I wanted the flowers to stand out and not blend in with the blue and orange background. In return, she got a one-one lesson on the splendor of Diwali. It was a win-win for both of us! And lastly – add a few personalized touches for a lasting impression. A handmade Diwali sign and some personalized cards are sure to make your guests smile. These cards can alternately work as menu cards if you are hosting your non-Indian friends for dinner. Indian decor need not be tacky and gaudy - there I said it! Indian décor need not be tacky and gaudy! Indian décor is elegant and beautiful and let your home and table speak for that! The warm glow of the candles will surely knock your décor out of the park! Embrace the Diwali festivities with a piquant home cooked meal served in style. Once again, this post is about combining the Indian tradition of hospitality with the Western art of entertaining. I hope you all partake in a memorable Diwali meal this year and if you are hosting one - I hope I have inspired you to set a beautiful table! Our home awaits its guests! Let us also spare a minute to reflect on the spiritual traditions of Deepavali that bear significance to our every day lives. The killing of Narakasura by Lord Krishna symbolizes the triumph of good over evil. The waking up at Brahma muhurtha symbolizes the early to rise …..concept. The lighting of the diyas emphasizes the need for self-reflection and the need to move away from darkness and ignorance. I hope to be reminded of all these Diwali tenets as I look at the flickering glow of the candles on Diwali night. Dear readers we wish you health, peace and lots of colorful memories this Diwali. Now in keeping with the spirit of giving –Supriya and I want to giveaway a fifty dollar gift card of Home Goods and thank you all for your warmth and love! Love my candleholders? They can be yours with the giftcard - see below for details! If you loved the crystal candleholder or the Italian etched wine goblets (they are perfect for serving mango lassi or badam milk this Diwali) I have used in this tablescape then here is your chance to buy it with the gift card we are giving away. This giveaway is open to readers in the US. Readers in other parts of the world are welcome to enter on behalf of friends and family here in the US. 3. And finally! Increase your chances of winning by introducing additional new members. So, if you introduce 5 new members, you have 5 chances to win the gift card! The giveaway will close on October 24th at 10 pm eastern and the winner will be announced in our next post. Good luck! All images are from my home and shot by Uj. Please do not use without permission. Thank you Nayana! Previously, crystal was not really my thing and I could have never envisioned using it in an Indian palette but this arrangement was an attempt at stepping out of my comfort zone and I am glad i pushed myself. And yes, a little hand made is a must. Please do participate and share the giveaway - we want one lucky winner to have fun shopping at TJ MAXX home goods. Rachel - welcome to Aalayam. Make sure to join our growing family. The candle holders add a little punch to this whole arrangement, no? Beautiful images and a lovely post. Very inspirational! Thank you Anu. Hope you are feeling better? I am glad this post is being well received . I am constantly looking for decorating inspirations myself so to share mine is a pleasure. There's a gift card waiting - want to try your luck? I am sure your keen eye can spot something fun at Home goods..
Love the images and especially loved the way you wrote about your childhood memories... its those tiny moments, that at the time seemed insignificant, but we somehow end up remembering and cherishing them and they come to define how we in turn celebrate... thanks for sharing Deepa! I hope your daughter has a magical first diwali! Thank you for your kind words. Have you signed up Rimple ? That will make you eligible for the giveaway. Lakshmi- thank you for taking the time to comment. And we spoke offline too - i will definitely answer all your questions about how do I collect my accessories, how much and so on.. It's got me thinking, maybe even a post would be resourceful for all our readers! Su - thank you. You should - chalk board signs around the house, marigold garlands on door frames, rows of diyas on mantle --- posssibilities are endless. come back and share with us. Beautiful tablescape, Deepa. Loved the attention to detail. Interesting blend of non traditional items :). Often I notice myself wanting to recreate something from my childhood, be it a taste, texture or anything. I guess the feelings associated remains longer with us, even tho memories may be hazy. Loved the group of ladies painting on the wall. Thanks Radhika. How are you? had not heard from you in a long time :) Yes, I looked at the scooter sitting in my husband's den and said - "you are going in my diwali decor", it was a compelling thought. i had to try it out :) and you are absolutely right about nostalgia. Like the appams I mentioned in the post - i crave for that every yr and only around diwali - it is a conditioned response! And please get a friend to sign up - you will be eligible for the giveaway. very creative of you and surely a treat for my eyes...Happy Diwali. glad you liked it. Please add yourself as an Aalayam member, so we can count you in for the giveaway. Happy Diwali to you and your family!! It is a beautifully set table. Every detail caught our attention , right from Moroccon tea glasses to scooter to chandlier inspired candle holder to personlised cards. The paisley design and flower vase added that splash of colour. Special mention has to be given to the scooter and silver table mat below plates. As you rightly mentioned indeed Diwali is all about sparkle and colour. Keep up your good work and keep us inspired. Thank you so much Jayaguru for such a thoughtful comment. Yes, I had to use moroccan tea glasses as water tumblers (the paisley tied into the theme well!) It is the discerning reader that notices all the details and I am glad you picked up on the subtleties of this palette. Thanks again for your encouraging words. I will do a feature on ravi varma paintings some day. My husband is a huge fan and we have several around the house. Happy deepavali to all of you - once again! Love the blue-orange contrast! And what a varied and interesting cutlery collection you have Deepa! Wish you and Supriya, and your families a great Diwali. Thanks Ambika! Well the blue - orange just happened. The orange napkins were from my Varnangall place mat set, and I bought the white and orange napkins back in spring - so this was an attempt at making what I have work. Yes, I love collecting serveware and flatware - one bit at a time...and then they all get mixed, matched and used.. Interesting job this home making thing, eh? Thank you for your wishes. We wish you all a very happy diwali too - once again!